So as I have don't the last few years, I cooked a big ham and all the fixin's just for me and my daddy on Easter afternoon. I can only eat leftovers for a day or two before I am over it so I end up freezing large portions of the ham for later use. But this morning I came up with this little diddy. Egg Muffins. 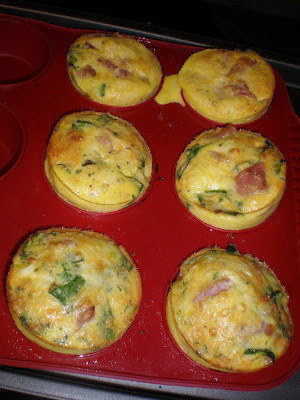 So good and will keep in the fridge to re-heat and eat throughout the week for breakfasts and snacks. 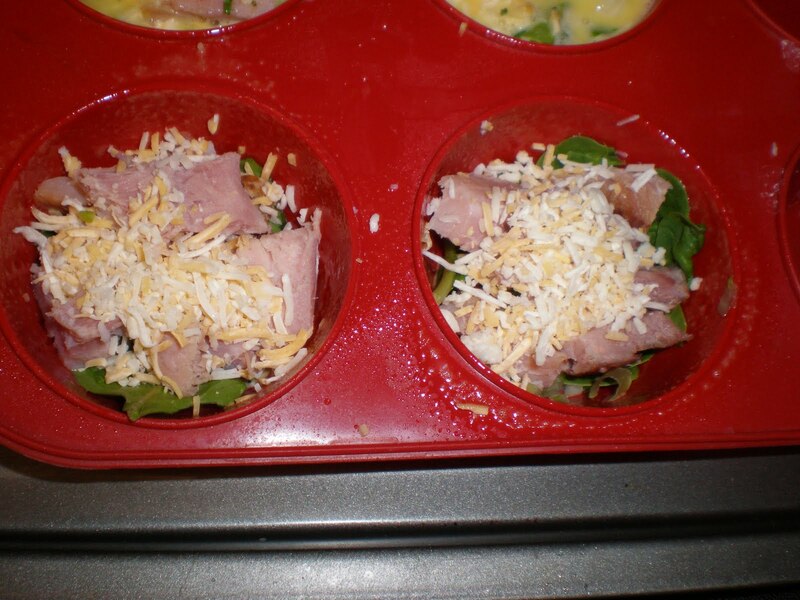 You can use whatever ingredients you have on hand- great for leftovers. Preheat oven to 375. Spritz muffin cups with non-stick spray. Add goodies (minus eggs and milk product) in muffin cups. So everything other than the eggs and milk and S and P go in the cups now. 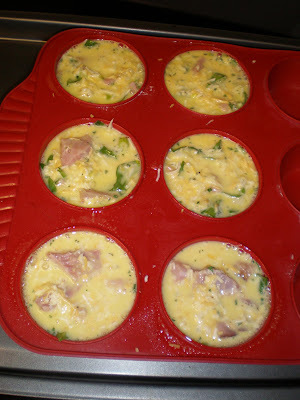 In a small bowl, mix the eggs, milk, salt and pepper (and any additional seasoning). Divide into the 6 or so cups. Fill about 3/4 full. Bake for about 30 minutes until puffy and dry in the middle. Serve hot or let cook, keep in the fridge, and reheat for future enjoyment. Yummy! How clever! I would never have thought to do that. Those look good. Did you come up with this recipe on your own? It's a winner. We have SO much ham leftover, it's not even funny! I'm definitely making these tonight, they sound so yummy! That's such a great idea! I finally finished my leftover ham today. These look amazing! I may have to experiment with these on Sunday morning!!! Thanks!! !